London:Former Pakistan prime minister Nawaz Sharif's wife, Begum Kulsoom, passed away on Tuesday, according to the media reports. Pakistan Muslim League-Nawaz President Shehbaz Sharif and his son, Hussain Nawaz, confirmed that the former first lady breathed her last at a clinic in London.Further, Harley Street Clinic confirmed her death and said it will be reported to the coroner shortly. Body will be shifted to a mortuary soon, the clinic said. Further, sources at Adiala Jail said the former premier, his daughter, Maryam Nawaz, and son-in-law Captain (retd) Safdar have been informed about Begum Kulsoom's passing.Begum Kulsoom was under treatment at London's Harley Street Clinic since June 2017.She was placed on life support last night as her health deteriorated. Sources at the clinic said she had developed a lungs problem again. "She had been responding well without the ventilator until last night," the sources said.According to sources, the Sharif family has decided to bring back Begum Kulsoom's body to Pakistan. "She will be laid to rest in Pakistan," the family confirmed. 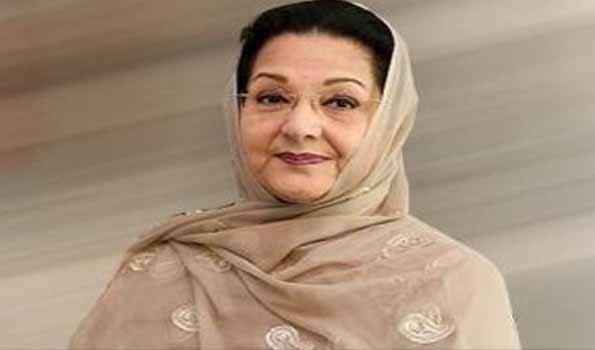 Begum Kulsoom was diagnosed with lymphoma (throat) cancer in August 2017.The former first lady was born in 1950. She married former premier Nawaz Sharif in 1971. Her husband, daughter and son-in-law are currently serving a jail sentence at Adiala Jail in Rawalpindi. Prime Minister Imran Khan expressed deep grief and sorrow over the demise of Begum Kulsoom.In a statement, the prime minister said all facilities will be provided to the family and heirs of Begum Kulsoom as per law.The prime minister has directed Pakistani High Commission in London to assist in the provision of all necessary facilities to the heirs of the deceased.